Identification. Sighted on 3 November 1493 during Christopher Columbus's second voyage to the "New World," Dominica was named for the day: dies Dominica, "the Lord's Day" or "Sunday" in Latin. Carib Indians from South America had inhabited the island for almost six hundred years and other Amerindians had been there for as long as three thousand years, but their name for the island, Waitukubuli, meaning "Tall is her body," was not recorded for another two centuries. Spain soon lost interest in the island, but France and England fought each other and the Caribs for control throughout the seventeenth and eighteenth centuries. After changing hands several times and two centuries of continuous British rule, Dominica became an independent republic on 3 November 1978. Location and Geography. Not to be confused with the nearby Dominican Republic, Dominica is located between French-controlled Martinique and Guadeloupe in the eastern Caribbean. The capital, Roseau, is located on the calm Caribbean Sea on the western coast; the rougher Atlantic Ocean forms the island's eastern shore. Though only 29 miles (47 kilometers) long and 16 miles (26 kilometers) wide, those who have tried to settle and develop the island through the centuries have been frustrated with the difficulties of accessing its 290 square miles (751 square kilometers) of land area. With peaks over 4,500 feet (1,370 meters) high, it is the most mountainous island in the Lesser Antilles and one of the last islands in the Caribbean to be colonized. It provided refuge for indigenous Caribs and later for maroons (escaped slaves), and never developed the large-scale sugar plantations that characterized other colonies. Lush tropical rainforests cover two-thirds of the island, and annual rainfall ranges from 50 inches (127 centimeters) on the coast to 300 inches (762 centimeters) in the mountains. Its volcanic origin is evident in bubbling sulphur springs and the Boiling Lake, located in the 17,000-acre (6,885 hectare) Trois Pitons National Park (a UNESCO World Heritage Site since 1998). The island has few white sand beaches, but numerous waterfalls and rivers (Dominicans say there is one for each day of the year). Demography. The 1991 population census counted 71,183 persons and provided an estimate for 1998 of 74,300 people. About twenty thousand reside in Roseau and its environs, reflecting the "drift" to the urban center during the last several decades of the twentieth century. A majority of the population, 89 percent, is of African descent, 7 percent are of mixed race, and 2 percent are Carib. The remaining 2 percent identify as white, Syrian Lebanese, East Indian, Chinese, and Portuguese. of the rural population, its use is now declining among the younger generations. The Konmité Pou Etid Kwéyo`l (Committee for Creole Studies) was created in 1981 as part of the government's Cultural Division to document, promote, and preserve the language. Symbolism. Dominica's national motto is Apres Bondie C'est La Ter, "After God, it is the land," emphasizing the country's French-creole heritage, strong religious orientation, and dependence on the soil. The national flag depicts a Sisserou parrot, found only in Dominica, within a red circle surrounded by ten green stars representing the parishes of the country; this is centered on a cross in yellow, black, and white stripes on a green background representing the lushness of its rainforests. The three-colored cross symbolizes the Trinity of God; yellow represents the main agricultural products (bananas and citrus); white, the clarity of its rivers and waterfalls; and black, the rich volcanic soil and its African heritage. The national flower, the indigenous Bois Caribe ("Carib wood"), was chosen because of its hardiness and for having persisted throughout human habitation of the island. It is said to represent the nation's history and continuity, and the ruggedness and resourcefulness of its people. Emergence of the Nation. Geography has played a guiding role in the island's history. Due to the mountainous terrain and the resistant Caribs who inhabited it, Dominica was unclaimed by European powers until settled by French planters and missionaries in 1635. England, France's rival, soon vied for control. In 1686 both nations agreed to relinquish the island to the Caribs, yet repeatedly returned. By 1750, the Caribs had retreated to the rugged windward coast (they now reside in an area called the Carib Reserve). In 1763, France ceded Dominica to England in the Treaty of Paris. The French captured the island in 1778, but the English regained control in 1783. The British concentrated in Roseau, and overseers ran estates for their absentee owners. The French, however, lived on small estates and remained well after the British took official control. A peasant-based agricultural economy and creole culture emerged. Maroons, often supplied with weapons by the French, terrorized the British from 1785 to 1814. Emancipation for all slaves was granted in 1834. Freed slaves from Dominica, Martinique, and Guadeloupe eventually took over the small estates. Dominica became the first and only British Caribbean colony to have a black-controlled legislature following the abolition of slavery. Called the "Mulatto Ascendency," they played a powerful role in politics, government, and cultural affairs into the twentieth century. Dominica became part of the Leeward Islands in 1833, but changed affiliation to the Windward Islands in 1940. The country became an associated state within the British Commonwealth in 1967 before claiming independence in 1978. National Identity. Social and political unrest (including attempted coups in 1980 and 1981), economic instability, and the devastating Hurricane David in 1979 complicated the transition to independence. Further divisions included language and historical settlement patterns, as rural villages were relatively isolated from each other and from Roseau and Portsmouth, the second largest town, since colonization. 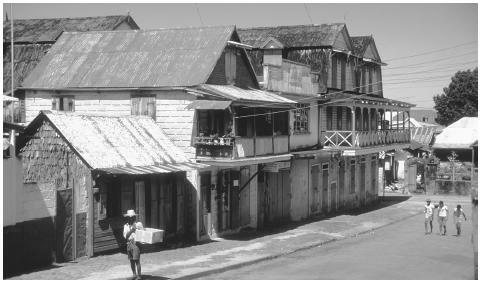 Despite internal differences, the national identity embraced by urban intellectuals and the government was the cultural heritage highlighting French, African, and Carib influence, more than British. A discourse of development unites the country. Ethnic Relations. The population is predominantly of African descent. The Carib reside primarily on the Carib Reserve, but aside from maintaining some ancestral practices (such as basket weaving and boat making), they live like rural peoples around the island. People who identify as Syrian, Lebanese, and Chinese own some of the largest businesses in Roseau. Although there is some ethnic stereotyping, more salient social divisions fall along class, language, education, and rural and urban lines. Roseau is the island's center of government, commerce, health services, education, and communications. The largest French settlement, it was named after the reeds that grow along the nearby Roseau River. French houses grew up haphazardly around a central market square; when the British came to power, they planned the remaining streets and house lots on an orderly grid system. Most buildings are small-scale, ranging from Victorian wood and stone townhouses with large verandas and fretwork to newer, more hurricane-resistant concrete structures. The city is dwarfed by the multi-story cruise ships that call at its newly rebuilt port. A large black and white crucifix and shrine on Morne Bruce overlooks the city. Old stone forts built by the British and expanded by the French include Fort Young in Roseau (now a hotel) and Fort Shirley in Portsmouth (in Cabrits National Park). Rural villages vary by population and size. Many have a school, health center, post office, one or more churches, and rum shops. Larger villages have a community center and playing field for cricket. Rural homes are traditionally made of wood with galvanized metal roofing, and are perched on stilts. They usually have two or three rooms and a separate outdoor kitchen with a coal pot, fire, or more modern gas stove. Most are sparsely furnished, though those who can afford it fill their homes with store-bought knicknacks, dishes, and appliances. Some larger Western-style concrete houses with recently-available amenities like electricity and indoor plumbing are being built. Yards are kept neat and clean in both rural and urban areas. People socialize at shops, community centers, churches, or on the street. Food in Daily Life. Dominica's rich volcanic soil and abundant rainfall are ideal for growing a variety of fruits, vegetables, and root crops. These are sold at market or by street vendors, but people typically grow enough for their own consumption. Bananas and plantains are central to rural diets, and are prepared in a variety of ways. The growing and processing of manioc into cassava bread and farina was once a major subsistence activity, but now wheat bread is widely available from local bakeries. Land crabs, river crayfish, opossum, agouti, and fish are caught where available. Locally raised livestock include goats, pigs, and some cows. Crapaud or "mountain chicken," a type of frog, is the national dish, but a more popular creole dish is roasted breadfruit with salted codfish, onions, and peppers cooked in oil. Imported frozen chicken and turkey parts, tinned milk and sausages, and packaged snacks are increasingly popular. Staple foods like flour, sugar, salt, and rice are purchased in town or from village shops. Individuals often sell homemade cakes, coconut milk ice pops, and sweets from their homes. Urban residents obtain produce from relatives outside the city or purchase it at market. There are several large American-style supermarkets in Roseau, offering expensive imported goods. Most restaurants are located in Roseau and Portsmouth; in rural areas, shops may sell sandwiches or fried chicken. Kentucky Fried Chicken, an American fast food restaurant, opened in Roseau in 1997. When guests visit a home in both rural and urban areas, it is expected that some food or drink will be offered. Lunch is the largest meal of the day. Food Customs at Ceremonial Occasions. Holidays and important religious ceremonies are celebrated with the slaughtering of livestock and the preparation of large meals. Guests visit homes throughout the day and are given food, desserts, and alcoholic beverages or other drinks. Catholics make offerings of fruits and vegetables during church services or special masses. Dominicans socialize on the street and in other public areas. Basic Economy. Agriculture is the mainstay of the economy, with bananas the chief export crop. Citrus and coconut products are also exported. The economy has historically relied on a successive monocrop strategy, but shifting markets, fluctuating prices, and natural disasters have recently increased calls to diversify. Land Tenure and Property. 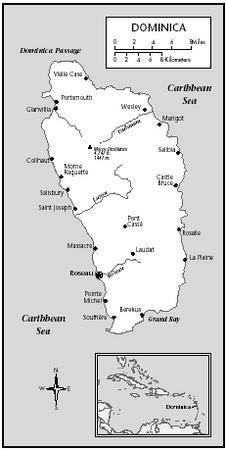 In 1763, British surveyors divided the island into lots for sale; only 232 acres went to the Caribs. For the next two centuries, most large estates belonged to British or long-established French families. These were bought up during the "banana boom" of the 1950s by foreign investors and Dominican merchants and professionals moving into agriculture. Small-scale farmers remained scattered between the larger estates. In the 1970s, many estates were sold off in smaller plots. Today, land ownership with deed is highly valued by peasant farmers; land is also rented or worked by squatters. The Carib Reserve was expanded to 3,700 acres by British administrator Hesketh Bell in 1903, but by law it is communally owned by all its residents. Commercial Activities. Agricultural products and manufactured goods including coconut soaps, bay leaf oils, juice concentrates, rum, cigarettes, paint, and plastic sandals are produced for sale. Major Industries. The major industries include food processing, coconut product manufacturing, paint production, rum distilling, and handicrafts. There is a small commercial fishing industry and some commerce in timber and pumice. Tourism is developing, but is hindered by a lack of accommodations and an international airport. Billed as "The Nature Island of the Caribbean," recent efforts promote cultural ecotourism. Day cruise ship visits increased dramatically in the 1990s. Trade. Imports total twice as much as exports. Manufactured goods, food, machinery, and chemicals are imported, chiefly from the United States. Agricultural produce is exported to CARICOM countries and the United Kingdom. CARICOM (Caribbean Community and Common Market), a treaty established and signed by most Caribbean nations in 1973, coordinates foreign policies and economic integration. Bananas are sold to Geest, a British multinational corporation. Merchants travel to neighboring islands to sell agricultural produce and handicrafts. Division of Labor. Professional positions, including highly desirable government jobs, generally require secondary and usually some post-secondary education. Rural villagers are predominantly peasant farmers, and sometimes run small businesses. Larger businesses are owned by upper-class Dominicans and Syrian and Lebanese merchants. Classes and Castes. Prime determiners of social class are wealth, level of education, occupation, and family history including family name, and class may change through educational advancement or pursuit of a prestigious occupation. The wealthier upper classes are concentrated in Roseau, but there are also marked differences in social class and status in rural villages. Symbols of Social Stratification. Styles of dress, food, and language were traditionally major symbols of class differentiation, and strongly reflected rural/urban differences. Today, however, rural folk desire the same goods and modern conveniences as urbanites. English still tends to be associated with the educated upper classes and Kwéyo`l with lower-class peasants, but this is changing as rural areas become more accessible and education more widespread. Government. Dominica has a British parliamentarian system of government, headed by a president and prime minister. The thirty-member unicameral House of Assembly has twenty-one elected and nine appointed senators, plus the Speaker of the House. A local government system allocates each village a council headed by a chairman (called a chief in the Carib Reserve). Leadership and Political Officials. There are three principal political parties: the Dominica Freedom Party (DFP), the Dominica Labour Party (DLP), and the United Workers Party (UWP). The DFP, headed by Dame Eugenia Charles, governed from 1980 until 1995. Charles, known as the "Iron Lady of the Caribbean," was the first female Caribbean prime minister. She supported former United States president Ronald Reagan in the 1983 invasion of Grenada. The UWP, under the leadership of Prime Minister Edison James, won the 1995 elections. In 2000, it lost to the DLP and Prime Minister Rosie Douglas, who died after eight months in office. He was replaced by Prime Minister Pierre Charles in October 2000. Elections are held every five years and are generally peaceful. Supporters travel the island in caravans by political party, and candidates often sprinkle campaign speeches with Kwéyo`l during rallies in rural villages. Political officials are generally respected and often invited to attend important meetings and events in villages; they may be severely criticized, however, if popular opinion turns against them. Social Problems and Control. Since the early 1980s, crime has been very low. The police force is based in Roseau and maintains departments in larger villages. The court system is used to resolve land disputes and slander cases, but problems are usually settled within the family or village. Military Activity. The police force includes a Special Service Unit and Coast Guard. The Social Welfare Department was established in 1945. Since then, it has gradually expanded to include a national system of Social Security and various divisions such as Community Development, Local Government, Youth, Sports, Culture, and the Women's Desk. Several nongovernmental organizations (NGOs) have been established since independence. They often work together and with the government to utilize limited funds for projects in rural development, agriculture, health, women, and culture. Funding and assistance come from churches (especially the Roman Catholic Church) and several international agencies including UNESCO, UNICEF, and the United States Peace Corps. Division of Labor by Gender. Women and girls are primarily responsible for childcare, cooking, and household chores. In rural areas, they often grow vegetables and raise small livestock. The majority of vendors at the open-air markets are women, and many women supplement household income by selling homemade sweets and baked goods, weaving baskets, or by working as house cleaners or childcare providers. Men harvest and sell bananas (the main export) and other crops, tend large livestock, fish, hunt, and work in construction. Both men and women are employed as professionals. Men hold more positions of authority in the churches, but both men and women are active in politics and village affairs. A foundation on stilts, wood construction, and a metal roof typify rural homes. The Relative Status of Women and Men. Women's work is often valued less than men's work, although women's contributions are equally or more important to household maintenance. Women are criticized if they spend too much time out of the home, while men are allowed more freedom. Women, particularly as mothers, are very involved in community life and are often the center of extensive kin networks. Marriage. Only monogamous marriages are permitted by law. Marriage is based on individual choice, though generally limited by social class and religion. Many young people have children, often with multiple partners, and may cohabit for years before legally marrying, despite church disapproval. Men are expected to contribute financially to their children's upbringing, regardless of their relationship with the mother. Except among the upper classes, marriage usually comes later in life, after age thirty. Divorce is legal, but is rare and is frowned upon. Domestic Unit. The household may be headed by a man or a woman. Households may consist of one person, a woman and her children (perhaps visited by her boyfriend), a nuclear family with the parents either married or cohabiting, or an extended household that includes several generations. Several families, often related through one matriarch, may have separate homes but share a common piece of land or yard with an outdoor kitchen or other resources. Inheritance. The predominant inheritance practice is "family land," in which a parcel of land is owned jointly by descendants of the original owner, either male or female. Use of the land is determined by consensus or family tradition. Oral agreements frequently lead to disputes, but no part may be sold unless all co-owners agree. Kin Groups. Kin groups extend beyond the household to include those related through blood lines, marriage, and friendship both within and outside the village; Dominicans frequently say that everyone on the island is related. Financial and material resources are often shared, and child fostering is common. Many households depend on money sent from relatives who have migrated overseas. Infant Care. Children are cared for primarily by their mothers, but also by other relatives, friends, and neighbors. In rural areas, families rarely have separate cribs or rooms for infants, and they stay with the rest of the family. Small babies are kept at home, but are soon brought along to the fields, river, and elsewhere. When they begin to walk and talk, children are given small household chores. Once they start primary school, they are expected to run errands and look after smaller children. 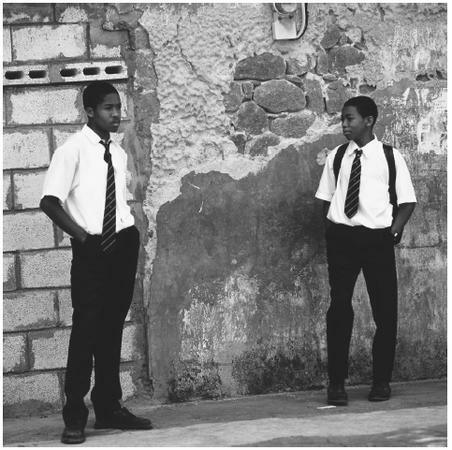 Uniformed schoolboys wait for the bus in Roseau. Opportunities for education after age fifteen are limited. used when a child is troublesome or rude. Yet both boys and girls are taught to stand up for themselves and to engage in verbal play and teasing. Education is increasingly valued and is seen as a way out of the rural farming life. Preschool is available to those who can afford it. All children can attend primary school from ages five to fifteen, but must get a high enough score on the Common Entrance Examination by age thirteen to secure one of the limited spaces in a secondary school. As Kwéyòl is widely thought to interfere with children's learning of English, many rural parents now try to speak only English with their children. Higher Education. Post-secondary education is limited to the Teacher's Training College, the Clifton Dupigny Community College, and a small branch of the University of the West Indies for continuing education. Adult education classes are offered in Roseau, Portsmouth, and occasionally in villages. Further education or training must be obtained on other islands or elsewhere overseas. According to the 1991 census, only 2 percent of the population receives a university education. Greetings such as "good morning" or "good afternoon" are the most basic form of social interaction. People are expected to greet when they telephone, visit someone's home, or simply pass one another on the street. Strangers are eyed with suspicion, but are treated warmly once introduced. Close friends, especially girls, stand close to one another and often walk with arms around each other's shoulders or waists. Privacy is difficult to maintain but is highly valued; items are concealed when carried in public, and domestic problems are dealt with in the home. Religious Beliefs. Roman Catholicism is the religion of over 70 percent of the population. None of the Protestant religions (Methodist, Pentecostal, Seventh Day Adventist, Baptist, Anglican, Jehovah's Witnesses, Church of God) exceed more than 5 percent. Carib and West African beliefs in spirits and obeah (witchcraft) persist despite church disapproval. Rastafarianism is followed by some. Religious Practitioners. Native Dominicans are now being trained as clergy, but practitioners of the formal religions, particularly Catholic priests and nuns, have generally been foreigners. Obeah practitioners or seers ( gadè ) are native or are from nearby islands. Rituals and Holy Places. The religions hold services in their respective churches. Residents of smaller villages often must travel to larger villages to attend church. Some villages have stone Roman Catholic churches dating to the seventeenth and eighteenth centuries, although new ones continue to be built in other villages. Many Protestant churches, especially Pentecostal and Seventh Day Adventist, have been built in the latter decades of the twentieth century. The frequency and days of worship depend on the religion. Death and the Afterlife. Many traditional practices and beliefs, such as the Carib custom of burying the dead in a fetal position, have been abandoned in favor of Christian traditions. All Saints Day is observed by visiting cemeteries and lighting candles on the graves of deceased loved ones. Common health problems include parasitic, intestinal, nutritional, venereal, and respiratory diseases, and illnesses like diabetes and hypertension. Dengue fever (but not malaria), teenage pregnancy, and sanitation are major health concerns. Life expectancy is seventy-five years for men and eighty-one years for women. The healthcare system includes a main hospital in Roseau; smaller hospitals in Portsmouth, Grand Bay, and Marigot; and clinics staffed with trained nurses around the island. Doctors, both Dominicans trained abroad and foreigners from technical aid programs and staff hospitals, periodically visit village clinics. There is an off-shore American medical school, Ross University, in Portsmouth. Traditional medical knowledge includes the use of herbs, plants, and tree barks to cure illnesses, induce labor, and so on. A combination of prescription and natural remedies is often used, despite being discouraged by healthcare professionals. The state's major holiday is Independence Day, 3 November. It is preceded by festivals, competitions, and events starting in August, including Heritage Day, Creole Day (Jounen Kwéyo`l), and the three-day World Creole Music Festival, which was begun in 1997. Other secular holidays include Carnival, celebrated the Monday and Tuesday before Ash Wednesday, and New Year's Day. Villages celebrate their patron saints' feasts at various times during the year. Most fishing villages celebrate the Feast of Saint Peter and Saint Paul in June and July. Support for the Arts. The arts are largely self-supporting, although major events receive government, international, and private funding. Village cultural groups receive some government assistance, and organizations such as the Cultural Division, Dominica Festivals Commission, and Movement for Cultural Awareness support the arts locally. Literature. Largely due to the high illiteracy rate prior to the mid-twentieth century, most literature about Dominica has been written by visitors or foreign-born residents. Since the 1970s, there has been a surge of indigenous poetry, short stories, and plays, though much is unpublished or of limited availability. Local historian and anthropologist Lennox Honychurch has published detailed histories and academic scholarship about Dominica. Graphic Arts. There is a growing local interest in painting, wood carving, pottery, and sculpture. Baskets and handicrafts are sold to tourists. Performance Arts. African and European-influenced forms of traditional dance, song, music, and storytelling are performed at various cultural shows. The Karifuna Cultural Group was formed in 1978 to revive and promote ancestral Carib cultural expressions. There is a growing interest in modern creative dance. Lack of funding, resources, and facilities has constrained the development of the physical and social sciences in Dominica. Studies of the environment and people, particularly the Carib, have been carried out by foreign researchers and some Dominicans attending universities abroad. With limited funding, the government's Cultural Division researches and documents cultural and oral traditions. Andre, Irving W., and Gabriel J. Christian. In Search of Eden: Dominica, the Travails of a Caribbean Mini-State, 1992. Baker, Patrick L. Centring the Periphery: Chaos, Order, and the Ethnohistory of Dominica, 1994. Christie, Pauline. "Language Preference in Two Communities in Dominica, West Indies." La Linguistique, 30:7–16, 1994. Commonwealth of Dominica. Population and Housing Census, 1991. Cultural Division, Government of Dominica. A Directory of Cultural Activities, Artists and Major Cultural Groups and Institutions in Dominica, 1993. Higbie, Janet. Eugenia: The Caribbean's Iron Lady, 1993. Honychurch, Lennox. Dominica: Isle of Adventure, 1991. ——. The Dominica Story: A History of the Island, 1995. ——. "Carib to Creole: Contact and Culture Exchange in Dominica." Ph.D. Diss., University of Oxford, Trinity, 1997. Krumeich, Anja. The Blessings of Motherhood: Health, Pregnancy and Child Care in Dominica, 1994. Myers, Robert. A Resource Guide to Dominica, 1493–1986, 3 vols., 1987. Pezeron, Simone Maguy. The Carib Indians of Dominica Island in the West Indies: Five Hundred Years after Columbus, 1993. Stuart, Stephanie. "Dominican Patwa—Mother Tongue or Cultural Relic?" International Journal of the Sociology of Language, 102:57–72, 1993. Taylor, Douglas. Languages of the West Indies, 1977. Trouillot, Michel-Rolph. Peasants and Capital: Dominica in the World Economy, 1988.
wow! This is the best website for DOminica. It helped me a hole lot. This is amazing! The whole site is very well done and it's helping alot on my papers for these countries! Tahnks so much! The article about Dominica is very comprehensive and it is a great learning tool. I learned so much about my native island that I have forwarded the article to my American born kids. Great job! Thank You. Please update the article to include current events such as the filming of "Pirates of the Caribbean." Thanks a lot, this article helped me a lot in the making of my History SBA for CXC. thanks again. Hope you improve on the information so that next time i can come to this website for help. I lived on isle for 3 years with my dad and quickly became "part of their family" i really enjoyed reading this it brought me back there,and has really helped me with my french project. Some of the information is a bit off, but it matters where you are living what people say and believe about the original island. You did A very good job,but needs to be updated. Also you should have told more about the schooling system, natural disasters, formation of the island, rivers, waterfalls, natural sites, carib indians, and things to do on the island. Thank you for your information it was very helpful and interesting. I want to go to Dominica to turn someone who can help me Thanks! Okay I have a project due December 19,2011 And I'm still researching and let me just say THANK YOU right now I am OFFICIALLY DONE!!! And Did all my research on THIS page thank you once again 2 whoever made this page. Tell some more information on the age of dominica. This is a fantastic website! How can we cite this page in APA format? I have been searching and searching for a very long time to find out about my grandparents (my father's mother and father who I never met). My father's name is Anthony Laviniere, his father's name was Lawrence Laviniere and his mother's maiden name was Loraina(?) Laviniere (nee Gregoire). My father was born in January 1927. Can you please shed any lighton the family history and if the family were originally slaves. Thank you very much for this website .I really wanted to know more about where the man of my dreams comes from and I am so happy I now have an idea of Dominica. This is the only website on Dominica. There are a couple others too but not quite as good. I wish that they would tell more about relationships between people. Is there anyone on the island with the surname Andrew or Andrews. I am trying to trace ancestors from the Island. These I believe may have originated on this island. I have a DNA marker on Ancestry. I would appreciate anyones help please.